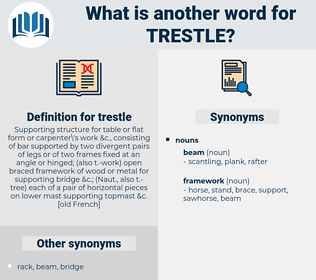 What is another word for trestle? Then she felt the trestle bound beneath her, and she was waked by the touch of Crosby's hand. I was glad when we were very politely invited to get out of the train and walk a plank over a puddle that for a moment submerged the track; glad when we were advised to foot it over a trestle - bridge that sagged in the swift current of a swollen stream; and gladder still when our locomotive began to puff and blow and slaken its pace as we climbed up into the mouth of a ravine fragrant with the warm scents of summer - albeit we could boast but a solitary brace of cars, and these small ones, and not overcrowded at that. 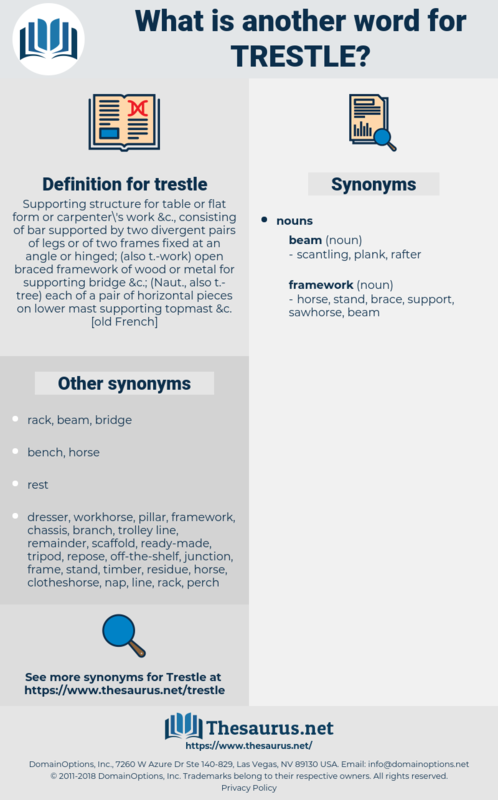 buck, sawbuck, supporting tower, horse, sawhorse.